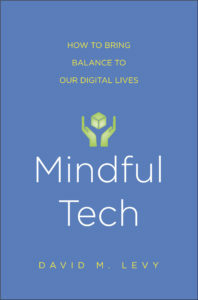 In Mindful Tech: How to Bring Balance to Our Digital Lives, David Levy offers a guide to being more relaxed, attentive, and emotionally balanced, and thus more effective, while online. In a series of exercises designed to help readers observe and reflect on their own use, David has readers watch themselves closely while emailing and while multitasking, and also experiment with unplugging for a specified period. Never prescriptive, the book opens up new avenues for self-inquiry and will allow readers — in the workplace, in the classroom, and in the privacy of their homes — to make meaningful and powerful changes. Want to get a feeling for the exercises in Mindful Tech? Try the Cellphone Observation, which can be found here. More information about Mindful Tech is available here.